Cousins Will and Tom have always wanted to become Trackers just like their uncle. While spending time with Uncle he shares the story of the Windigo with the boys. A story that seems to be coming true when Will and Tom hear strange noises outside of their bedroom window. And then they find the huge tracks in the snow. It has to be the Windigo - the Wandering Night Spirit of Winter! And the boys know what good trackers would do so they follow the trail deep into the dark forest to uncover the mystery. 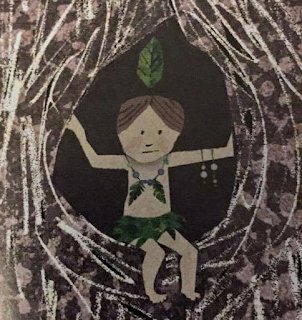 Young readers will be able to improve their tracking skills as they find clues hidden in the illustrations along with Will and Tom. I like Waboose's other books very much, and thought I'd be using a "recommended" label for this one. But then I got to the page where the boys are outside about to follow that trail into the forest. They're afraid but intrigued, too. The cousins stand like totems. Totems? That threw me. I asked a lot of Ojibwe friends and colleagues in Education and English, and they all thought it an odd word to use there. The cousins are standing, still. Does "totems" gesture somehow to totem poles? I didn't like Thisdale's illustrations, either. There is a new age quality to them that I don't like at all. Published in 2017 by Fifth House Publishing, I do not recommend The Spirit Trackers. Eds. note on Sunday, Sept 9, 2018: Many people responded to the thread I started on Sept. 7. Several asked if I knew about the Tribes Learning Community program. That question prompted me to add to the thread. I am adding the additional tweets as an update at the bottom of the post, along with a summary of some of the responses. "Some thoughts on the use of the word "tribe" by teachers and schools..."
Below is a thread I did on Twitter this morning. I used the spool app to compile the individual tweets so I could paste them here. A conversation is taking place on Twitter, where some teachers are asking other teachers not to use "tribe" to describe their classrooms of students. Some people are trying to push back on those asking that it not be done. They are pointing to dictionary definitions of the word (tribe) to say that it does not mean only Native people--that it has roots elsewhere. That's true. The word 'tribe' is not an Indigenous word. It is used to describe many other nations/peoples around the world. But--we are talking about the US. Here, that is precisely what it evokes. And here's another! I could do this all day long. If you are a teacher, please reconsider. This is a new-ish fad, but like many fads, it is harmful. Don't do it! I took a look at the site "Teachers Pay Teachers" and found many similar problematic ideas there. "Create a tribe" is one. It is like the too-many "what is your Indian name" activities that are everywhere. They draw on stereotypes. When you do these kinds of activities, teachers, you are introducing and/or affirming stereotypes. Remember! You're a teacher and you have a responsibility to educate children. Stereotypes do not educate! They misinform! Librarians: when you do these kinds of activities in your libraries, you are also misinforming children. Bottom line: there's too many ways this can--will--and DOES go wrong in a society that knows so very little about Indigenous people and our nations. 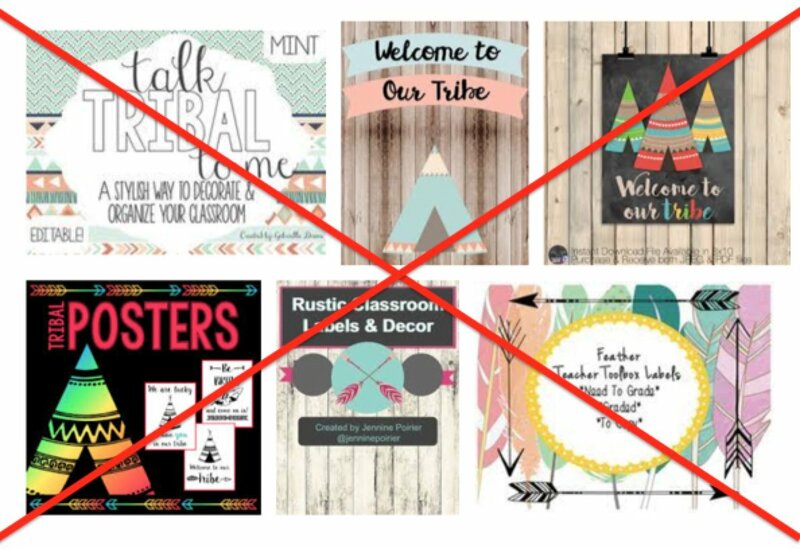 I recommend you step away from using "tribe" to describe your classrooms. 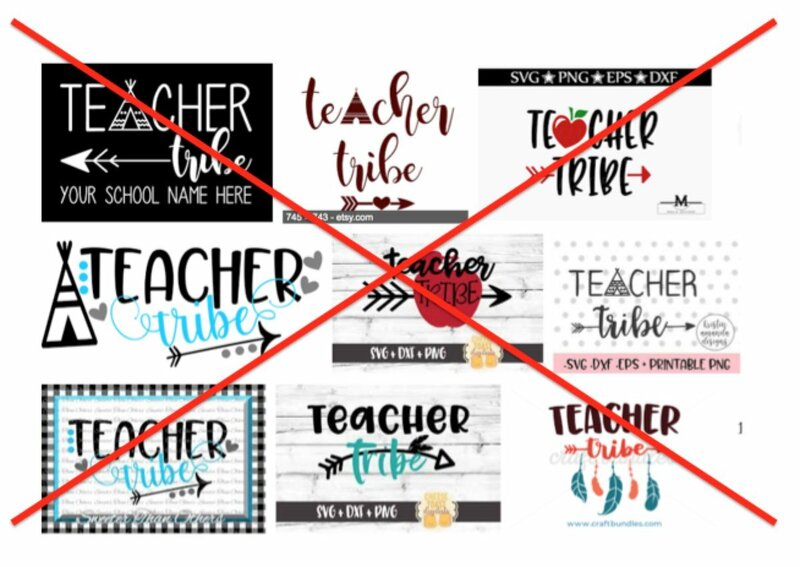 Picking up on my thread yesterday about teachers using "tribe" to refer to their classrooms.... Several people have written to ask me about the pre-packaged "Tribes Learning Community" and its use of "tribes". I gather it was created in the 1970s by Jeanne Gibbs and that its goal is to create classrooms where there was an emphasis on positive environments in the school and classroom. As the project was being developed, someone said "We feel like a family... we feel like a tribe." Gibbs and all those involved in the development and implementation of this "Tribes Learning Community" meant well. But I wonder--given the length of time it has been in use--if any of the teachers using it had a Native child in the classroom? If one of my daughter's teachers had been using it, I would have had a meeting with the teacher. 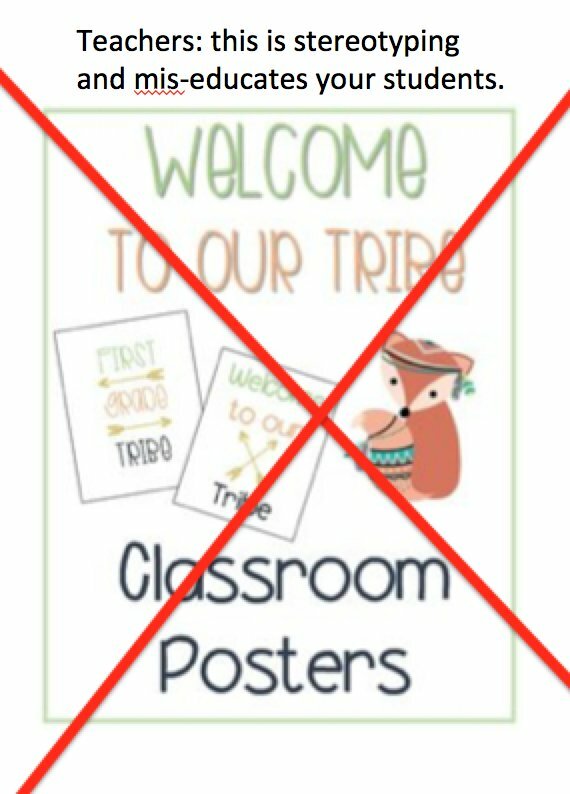 I support efforts to foster a positive environment (I was a classroom teacher, too), but there's no need to use "tribe" to do it. When I started this thread yesterday, I shared a few images of how "Tribes" materials look. A lot of those materials reference the Tribes Learning Community. Gibbs and her team are probably not monitoring the kinds of materials teachers use when they adopt Gibbs's program. But Gibbs and her team -- however -- are aware that some question its use. One of their trainers is Ron Patrick. On her website, Gibbs has a letter written by him, defending the use of the word. Correction: it isn't a letter. It is a statement 'Why the Name "Tribes"'. In it he says his tribe is Eastern Band of Cherokee. In his signature line, he used a phrase I associate with Navajo people (May you walk in Beauty). That's a bit odd, to me. "A Native American teacher, Paula Swift Robin, is talking with four other teachers at a conference in eastern Washington." Let's look at that sentence, critically. Why did TLC start with that particular person? With that particular name? I think they are using that person and her identity to protect them from being questioned. Now let's look at how they described her, as a "Native American." Is Paula Swift Robin a real person? If so, what is her nation? Does Gibbs know that Native people prefer to be identified by their specific nation? Gibbs writes that the Tribes Learning Community is used in Native schools. There's a comment from a person in one, in Ontario, but I don't think she is Native. If you are Native and it is used in your child's school, what have you seen? Given that the Tribes Learning Community emphasizes listening and positive classroom environments, I wonder if there's anything in any of their books about stereotyping of Native people? Do they help teachers with any of that? "Step by Step Process for Group Problem Solving. 1) Ask the tribes to discuss how they feel about people spraying paint on the wall of the school." The "tribes" discuss & then "tribe by tribe" they vote on a solution. Are there more than one tribe in any given classroom? Or is this example one where all the 3rd grade classrooms (for example) are participating? How does the person managing all of this designate a particular "tribe"? Is it by teacher name? If you have the book, can you share (in a reply, here) how tribes are delineated? One parent said that her child's classroom has a "tribes agreement" and asks if it is part of the Learning Communities program. It is a key component. She also says that arrows, dreamcatchers, and teepees are everywhere. She plans to speak to the principle and is optimistic. Many people asked about other words they could use. Others responded, suggesting team, squad, house, and family. In daughter's middle school they used "pathfinders" and "navigators" which I liked ok because they're about action and don't default to imagery that has problematic stereotyping associated with them. A parallel conversation evolved about the use of "spirit animal." I've written about that before: What is wrong with Buzzfeed's WHAT IS YOUR SPIRIT ANIMAL and Neal Shusterman's UNWIND dystology. Some raised questions over other problematic phrases. I've been working on a list of them, here: Common phrases. Some are working hard to understand why it is a problem. They see or use the word to describe their (or a friend's) classroom. I appreciate that they're trying to understand. They strike me as receptive to critical thinking. Others are resistant. They assert that they (or their children) are "part Native American" and think that carries weight. A claim to being "part Native American" is used as a defense of mascots, too. These are well-meaning but ignorant and ultimately, harmful to education. Yesterday, I wrote about the work of an Indigenous artist in We Rise, We Resist, We Raise Our Voices, an anthology edited by Wade Hudson and Cheryl Willis Hudson. Today, I'm back to talk about a different Indigenous artist, in another book with the theme of resistance. 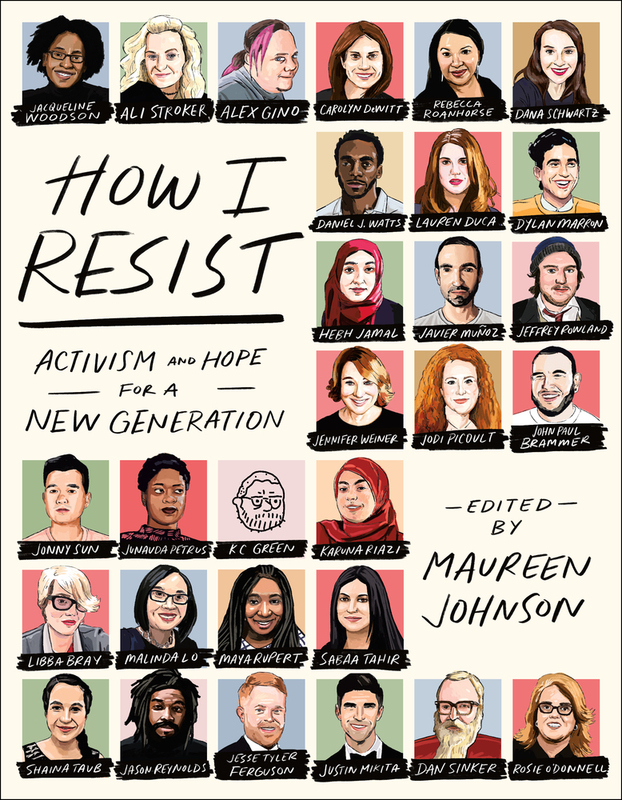 I'm talking about Rebecca Roanhorse's "Thoughts on Resistance" in How I Resist: Activism and Hope for a New Generation, edited by Maureen Johnson. Here's the cover--and isn't it gorgeous? I felt a mistake had been made. I'm not an activist. Every day I am alive, I am resisting those who would reduce Native Americans to a footnote in a bad history book. Some of us have been resisting since 1492. Awesome, right? She then refers to the Indigenous people who went to Standing Rock. She didn't go, but tells us that we can't all go to sites like that, and that some of us aren't "cut out to be frontline pipeline warriors." If, she writes "you're more like me, write." She suggests that Indigenous teens imagine worlds with Indigenous people in them--where they are not just surviving, but thriving. 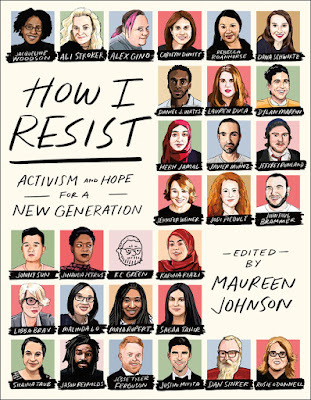 This, next part, for me, is precisely what I think this anthology is meant to do: inspire teens, to write! There's more, but I want you to get the book and read the rest of her essay, and the others in How I Resist, too! They're all different in length, style, and format (some, for example, are interviews). Published in 2018 by St. Martin's Press, I definitely recommend it! Roy Boney is one of the coolest people on the planet. I've written about his work before. He's done some excellent work in the Code Talker series, published by Native Realities. And--kidlit folks--if you're organizing a conference, invite him to sit on panels! I was blown away by the panel that he, Arigon Starr, and Lee Francis did at Returning the Gift last year. ...those types of images didn't express what my life was like. My family never ran around in buckskins, and we never lived in tipis. We drove cars, lived in houses, and watched TV like everybody else. And we laughed a lot! If I was going to make art, it would be art that I enjoyed and that expressed my experience as a Cherokee person living in the modern era. 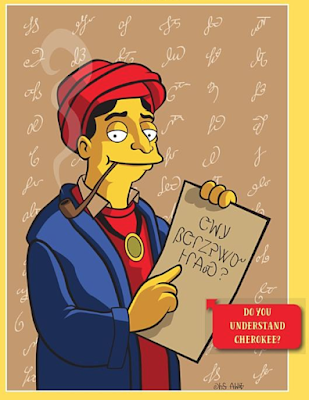 The actual piece is called Simpquoyah, and it is a cartoonized version of Sequoyah based on a popular television illustration style. [...] The caption in the drawing is written in Cherokee and translates as "Do you understand Cherokee?" The background is made up of the Cherokee syllabary as originally designed by Sequoyah himself! In the corner is my signature written in Cherokee. This is one of my favorites pieces because it combines several loves of mine: the Cherokee language, humor, cartoons, and digital illustration. 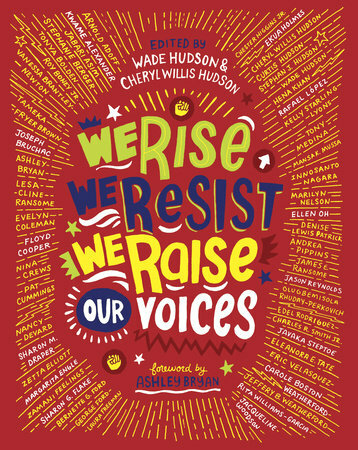 I highly recommend We Rise, We Resist, We Raise Our Voices, by Wade Hudson and Cheryl Willis Hudson. Published in 2018 by Crown Books for Young Readers, it is easy to see why it is getting starred reviews from mainstream reviewers. This post was initially titled "Debbie--have you seen American Apartheid: The Native American Struggle for Self Determination by Stephanie Woodard" but as I did some research on that book, I grew increasingly furious at Kirkus. I put that original title in parenthesis and inserted "An F'ed up KIRKUS Review" because that's where I am at the moment. In recent years, events such as the siege at Standing Rock and the Dakota Access pipeline have thrust Native Americans into the public consciousness. Taking us beyond the headlines, American Apartheid offers the most comprehensive and compelling account of the issues and threats that Native Americans face today, as well as their heroic battle to overcome them. Author Stephanie Woodard details the ways in which the federal government, states and counties curtail Native voting rights, which, in turn, keeps tribal members from participating in policy-making surrounding education, employment, rural transportation, infrastructure projects and other critical issues affecting their communities. This system of apartheid has staggering consequences, as Natives are, per capita, the population group that is most likely to be shot by police, suffer violent victimization by outsiders, be incarcerated, and have their children taken away. On top of this, indigenous people must also fight constantly to protect the sacred sites and landscapes that hold their cultural memories and connect their spirituality to the nation’s mountains, plains, waterways and coastlines. Despite these many obstacles, American Apartheid offers vivid pictures of diverse Native American communities that embody resilience, integrity, and the survival of ancient cultures. Looking at the Barnes and Noble website, I see that Louise Erdrich and Tim Giago blurbed it. I often go to B&N to see reviews because they usually post complete reviews. Amazon will use only positive excerpts from reviews, thereby mis-using the reviews (leaving out less-positive or outright negative critiques). As of right now (Monday, Sep 3, 2018), Amazon doesn't have any professional reviews at all. Barnes and Noble has one: from Kirkus. However, the book is marred by some misleading contentions. Woodard laments the disproportionately high incarceration rate for Native Americans as compared to whites, but she does not address the question of whether the former commit crimes at a higher rate than the latter. Moreover, her assertion that in 2016, Standing Rock Sioux confronted construction of the Dakota Access pipeline only through "nonviolent demonstrations" is not entirely true; there were numerous reports of violent acts committed by the protestors, including stampeding bison and hurling projectiles at law enforcement personnel. That reviewer says the book is "marred" by "misleading contentions" and then that reviewer gave two examples that make the reviewers ignorance or racism visible. Apparently this reviewer thinks that we commit crimes at higher rates than White people. Then, the reviewer talks about "violent acts" at Standing Rock. I assume the reviewer brought that up as evidence of our "violent" ways that make us commit more crimes than Whites. That reviewers remarks tell us that they believe stereotypical ideas of us as violent people. That is utterly disgusting and harmful, too, in so many ways. Kirkus--whether this is ignorance or outright racism on the part of your reviewer and that reviewer's editor, you really ought to address the content of that review! It was published in your May 15, 2018 issue. I wonder how many librarians saw that review and decided not to order the book? How many are reading the online review and making that same decision? How many readers are seeing that review at Barnes and Noble and deciding not to get the book? All of those decision are based on the ignorance of your reviewer. If you choose not to, your silence will be telling us a lot.